The City Museum is housed in what used to be a Victorian Barracks. The permanent displays in the city museum include the A Study in Sherlock: Uncovering the Arthur Conan Doyle Collection on the ground floor. Going up to the first floor there is “No Place Like Pompey” which includes 'Living in Portsmouth' this display is a set of rooms set up from different eras. There is a 17th century bed chamber, 1871 kitchen, a Victorian parlour, a 1930s kitchen and a 1950s living room. The displays continue with a 'Portsmouth at Play' display featuring Portsmouth at play on the beach, in the cinema and on the football field. There is also an art gallery in the museum which houses many paintings and postcards depicting scenes of Portsmouth's history. A newer addition is a computer games gallery charting the history of computer games with a chance to try out some old games. The museum as well as being housed in a magnificent building has grounds where you can relax. The City museum hosts many exhibits and displays and in the past has held a re-enactment of the Portsmouth 800 charter day where the first royal charter was granted to Portsmouth. 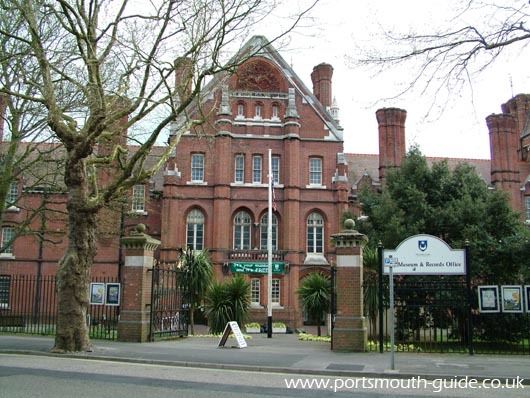 Portsmouth City Museum has their own website which can be found here.